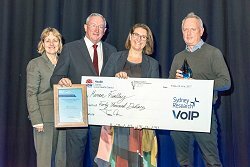 The 2017 Sydney Research Awards were presented by Dr Teresa Anderson, The Hon. Brad Hazzard, Minister for Health and Minister for Medical Research and Elizabeth Koff, Secretary, NSW Health at the 2017 Sydney Innovation and Research Symposium. 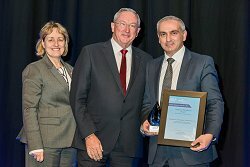 Professor Semsarian led this 3-year study of sudden cardiac death in the young aged under 35 years across Australia and New Zealand. This landmark study was published in the New England Journal of Medicine. Prof Semsarian is a cardiologist at Royal Prince Alfred Hospital; a Professor of Medicine at the University of Sydney; and Head of the Molecular Cardiology Program at the Centenary Institute, Sydney, Australia. Prof Semsarian has an established research program which is at the interface of basic science, clinical research and public health, with the ultimate goal to prevent the complications of genetic heart diseases, including sudden cardiac death, in our community. Associate Professor Anne Tiedemann is an NHMRC-funded Principal Research Fellow at the School of Public Health, University of Sydney. Her current research focusses on the evaluation of new strategies to increase physical activity participation among older people with the broad goal of promoting healthy ageing. Prof Janette Vardy is a medical oncologist working as a clinician researcher at the Concord Cancer Centre, University of Sydney. After completing a Clinical Research Fellowship and a PhD in Clinical Epidemiology at the University of Toronto, she returned to Australia in 2007 and together with Dr Haryana Dhillon established the Survivorship Research Group at the University of Sydney. Her main areas of research are Survivorship and Quality of life, with a particular interest in cognitive function and physical activity in cancer survivors. In 2013 she established the Sydney Survivorship Centre at Concord Cancer Centre. Dr. (Arnold) Lining Ju is a Heart Foundation postdoctoral fellow at the University of Sydney. He received Ph.D. training in biomechanics at Georgia Tech, USA and focused on developing a state-of-the-art nanotool (Biomembrane force probe ‘BFP’) to examine single protein interactions on cell surface. After that, Dr Ju commenced postdoctoral studies with Prof Shaun Jackson and together carved out an exciting niche research area in platelet mechanobiology through the establishment of the first BFP in Australia. His research into single molecules that trigger blood clotting could provide a potential new target for therapeutic intervention..
AHRIA funds will be used towards upgrading the current Olympus OSIS cellTIRF system with the STochastic Optical Reconstruction Microscopy (STORM) function, which would achieve <20nm spatial resolution. This will provide high resolution imaging to decipher platelet decision-making processes in blood clotting. Brooke Donnelly is the Senior Clinical Psychologist in the Royal Prince Alfred Hospital Tertiary Eating Disorders Adult Outreach team with over ten years of clinical experience treating adolescents and adults with severe eating disorders. She is also a PhD candidate at the University of Sydney's Brain Mind Centre, and has recently undertaken functional Magnetic Resonance Imaging (fMRI) research, examining the neurobiology of bulimia nervosa and binge eating disorder, with the goal of identifying how psychological treatment can be improved by integrating brain-based knowledge. Merran is the Executive Research Lead - Cancer Nutrition and Oncology Specialist Dietitian at Royal Prince Alfred Hospital. 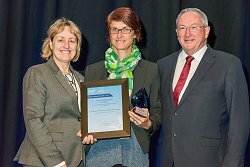 Specialising in nutrition support of people with cancer, she has been recognised by the Dietitians Association of Australia as an Advanced Accredited Practising Dietitian. 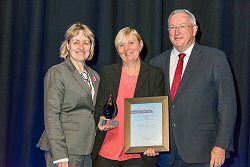 In 2015 she was awarded a prestigious National Health and Medical Research Council Translating Research Into Practice Fellowship to implement an innovative model of nutrition care for patients with head and neck cancer. 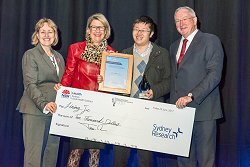 Merran will use this scholarship to develop and implement a next-generation nutrition care analytical dashboard for patients with head and neck cancer. Merran is currently overseas at the University of Oxford. 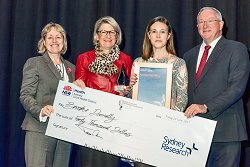 Accepting the award on her behalf is Danielle Miller, the Sydney Catalyst Research Manager.